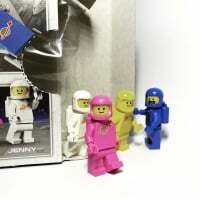 I found this in a Bricks 'n' Pieces issue. They said it was made for a 1985 Toy Fair (in England I presume). Looks amazing...anyone happen to have any other information or photos about this creation? I'd love to see the "crashing into the floor from 10 feet up" video that would be made these days for youtube. Even more impressive when you consider they didn't have Bricklink back then. Still, it's weird to see a space MOC of that size without any SNOT or greebles in sight. The technic bricks are not horizontal, so technically they are SNOT. Although the studs aren't used for building. There is also a vertical blue plate (on left hand side) using the old "horse ear" SNOT style of jamming a plate between studs. 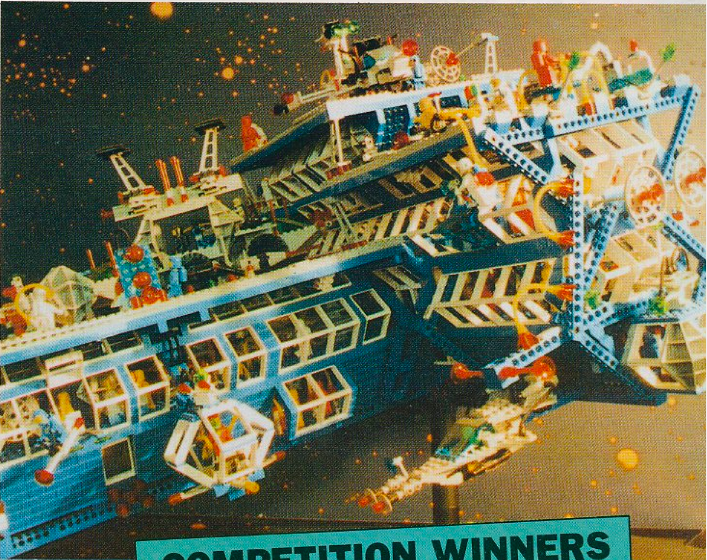 1985 Lego World fair program, and the theme was, you guessed it, space. [Edit] And page 10 of this is where the OP's scan came from, with full details of the competition. It could be headlight bricks, no? It could be, but I imagine it is the push the plate in vertically between the rows of studs way. That used to be used a lot for smallish plates. Wow, takes me back to the good ol days. thanks for finding these! ^Is that a resurrection ship from Battlestar Galactica? Wow. It's surreal to see a build of that scale from that era. Much more - a lot of the pieces (like all those windows and the upside-down slopies that make the hull) are not typical CS pieces. I love the Solar Energy Collector just sat on the top!